JOSUN INTERNATIONAL LIMITED (here after referred to as “JOSUN” ) is a pharmaceutical company which integrating with manufacturing, marketing, R&D in China. It was established in the year of 1994. Currently, we mainly produce and operate of antibiotics and chemical synthetic products. 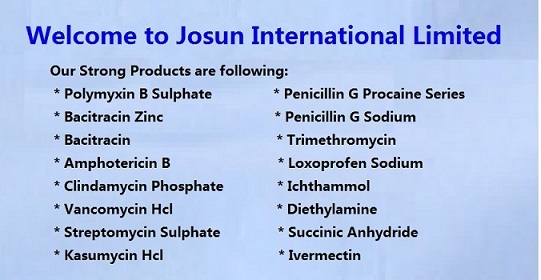 JOSUN has always been in the leading position in the export of pharmaceuticals, chemicials and other medical products. The products are divided into 3 classes, including Raw materials, Preparations as well as Medical appliances. JOSUN is striving to establish itself a reliable partner for a number of world’s leading pharmaceutical companies. Now please begin to enjoy the floating box on the right side!